As you may have noticed, I am a massive fan of Earthwise Beauty products. Massive! Today I’m going to review one of my absolute favourite products created and hand blended by the wonderful Ava. I’ve already mentioned Nap in the Meadow in one of my previous post and as said, I’ve been using it for a good few weeks. Not sure with what I should start first, the ingredients, the name, the skin benefits, the colour, oh my goodness this product is so good! Let’s start with the obvious thing. I’m not sure what I love most, the name or the colour of it. Nap in the meadow. Yes, please! Sounds dreamy. The light, pale blue goes just perfectly with the name, doesn’t it? There was this on time when I was speaking to this random guy on a train and he said he was picturing me in a flowy, pale blue dress walking or dancing in a field of flowers. Haha how random is this? Well Nap in the Meadow reminded me of that and even though the experience itself was a bit strange and slightly creepy (I mean who says something like that to a stranger? ), this memory was just another thing that drawn me to the product. So yes, I love the name and the colour of the product, but the ingredients are actually the most important thing when it comes to skincare. And here comes turmeric. In my opinion, turmeric is one of the best skincare ingredients. It works so well for my skin and I always want to try products with this magical yellow spice. I’m using turmeric and honey mask on a regular. Turmeric is very anti-inflammatory, brightening and contains loads of antioxidants. Besides Turmeric CO2 Supercritical Extract, this product also contains some other amazing anti-inflammatory ingredients. The first is deep blue Yarrow Oil from Bulgaria, distilled from white yarrow flowers, and is one of the top anti-inflammatory essential oils, along with German Blue Chamomile (distilled oil is dark blue) and Helichrysum. All this in the Nap in the Meadow. They used two Helichrysum or Italian everlasting essential oils in this beautiful product, one from Croatia and one from Bosnia. They each contribute slightly different chemical compositions and scents. Helichrysum oils are very expensive and the number one essential oil for revitalizing skin tissue in an utterly soothing manner (helichrysum is so mild, it can be used undilluted on burns). Plus more, all based in a cold-pressed Aloe Leaf Juice. Can't forget the meadow wildflower essences, all made by Ava - White Yarrow (for protection), Silvery Lupine (for strength, longevity; youth preserving), Wild Rose (youth, beauty, skin firmness), and Pink Phlox (to preserve one's gentle qualities and innocence). 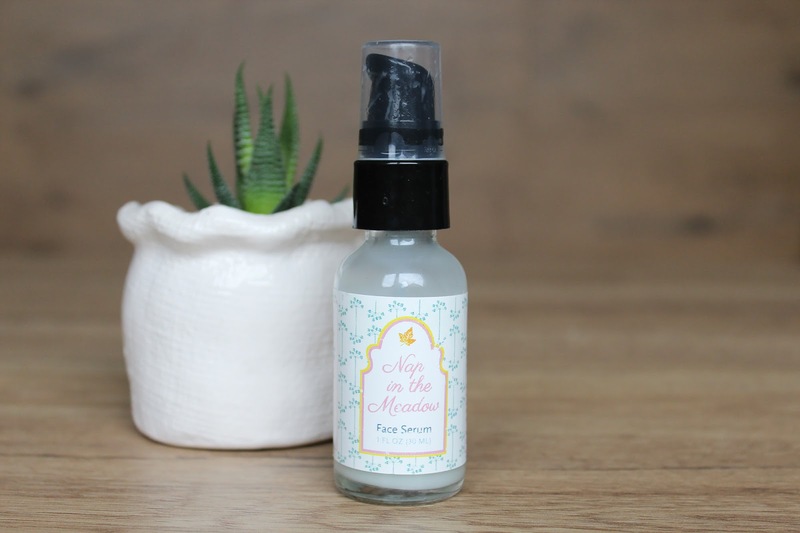 Nap in the Meadow is an ultra-lightweight aloe-based serum that looks minty or light blue. It's super lightweight, almost-liquid and is quickly absorbed into the skin. It packs such a punch to the skin that you wouldn't believe. It gives my skin a high dose of hydration, it's very refreshing and cooling, which I find extremely calming. Not only does it feel soothing because of the texture and the fact that I keep it in the fridge, it actually has strong anti-inflammatory benefits. Which is everything I need at this time when I'm dealing with my over the place hormones. I'm taking care of them with seeds and seed cycling. You should definitely google this if you're struggling with hormones, painful, strong periods and other similar problems. Back to Nap, which is my nickname for the product. 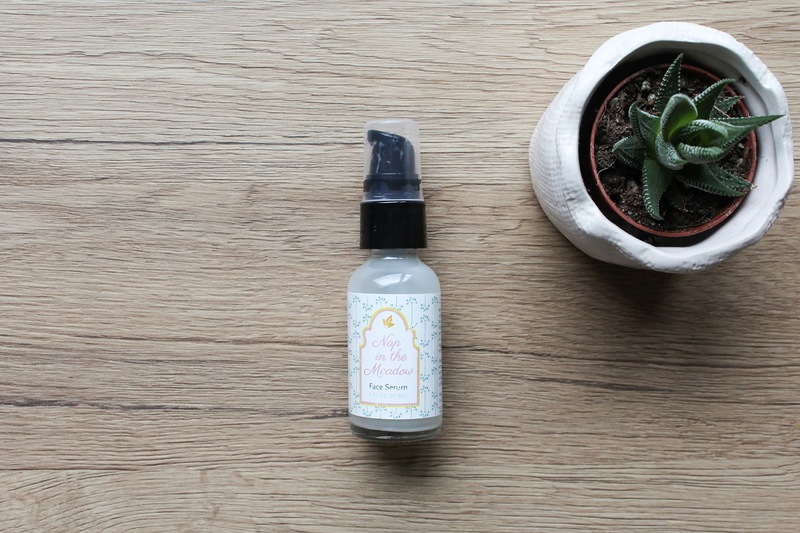 So, not only that it's hydrating and anti-inflammatory, this baby also helps with reducing hyperpigmentation spots, like acne scarring and spots caused by sun. The fact that it provides antioxidants and has anti-aging benefits, is just another plus. Like it needed any more. Nap in the Meadow is suitable for all skin types, especially dry, mature, acne, combination, oily, with eczema, rosacea, and psoriasis. It's cruelty free, vegan, cold process, handcrafted. I almost used the whole bottle of it (30ml) and I already repurchased it. So you know it's good. This product isn't that affordable but the fact that I ordered a second bottle of it, must mean something. Obseesed. You can get it here. Use my discount code "Loveliness" and get 15% off. 1,4 dioxane. I talked to Ava about it and I really respect that she talked with me, was open about my arguments and listened to me. She is now testing new options and I'm excited to see the Nap without polysorbate 20.